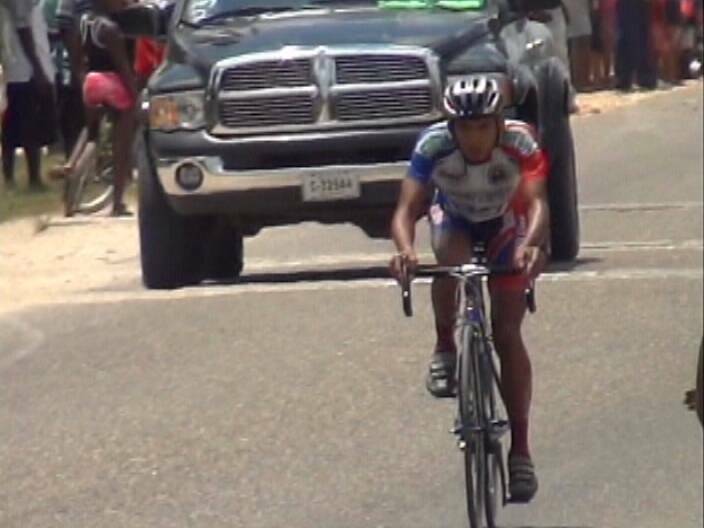 We take you immediately to the start of the 84th Annual Cross Country Cycle Classic which blasted off from in front of Leslie’s Imports at 6:00 a.m. on Holy Saturday with some 73 elite Belizean riders and 7 foreigners in search of fame and fortune. 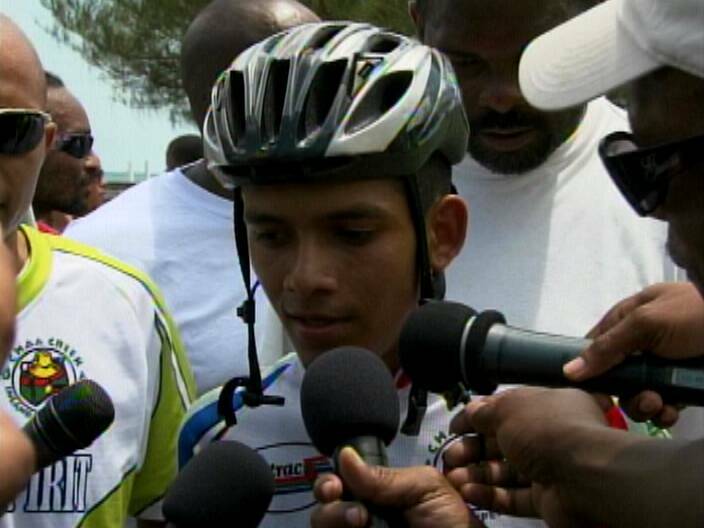 The national road champion, Byron Pope is posted as the #1 seed—but make no doubt about it they’re all here to start this 140 mile journey to San Ignacio and back. 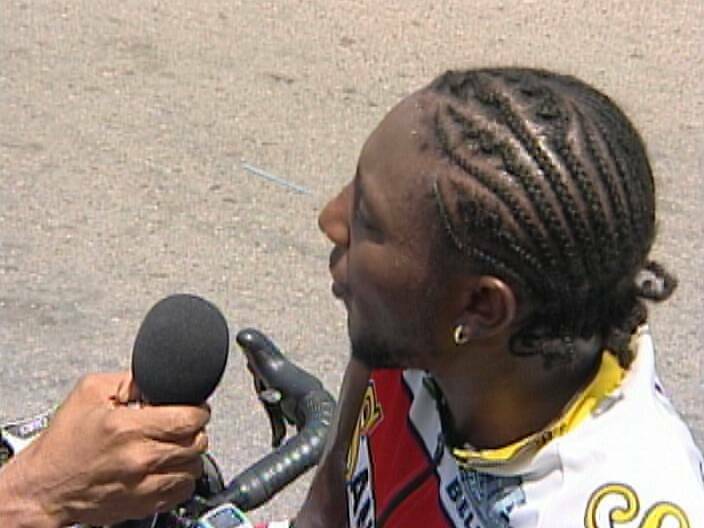 And so with the blast of the starting gun, this grueling cycle race begins and personally I would like to congratulate everyone who completed this race at anytime. This is not a walk in the park. At mile 9, we find this trio of Giovannu Choto, Allen Castillo and Sherman Thomas in full control of the pace having executed the perfect break out of the pack. This on the road alliance might not have bothered the big boys in the pelathon but it should have because being united by one singular aim they had been transformed into a mighty force. In fact around mile 21, Choto, Castillo and Thomas had extended the lead to 2 minutes 23 seconds. Of course this trio was well aware of the large chase group in pursuit led by Team Santino who had no rider up front. In addition they felt this lead was in cycling terms manageable. Around mile 40, Sherman Thomas began to exhibit signs of struggle and could not hang on to the pace so Choto and Castillo had no other option than to make it a 2 man lead. And as they zipped past the Belmopan Junction, this was the sight that greeted them. People from all walks of life came out to express support. AtMountHope, Giovanni Choto displayed strength going up the hill—grabbing the station prizes easily—Allen Castillo was obviously in trouble. Now here comes the main pelathon some 7½ minutes later with Jose Choto providing excellent blocking for his runaway brother and teammate. 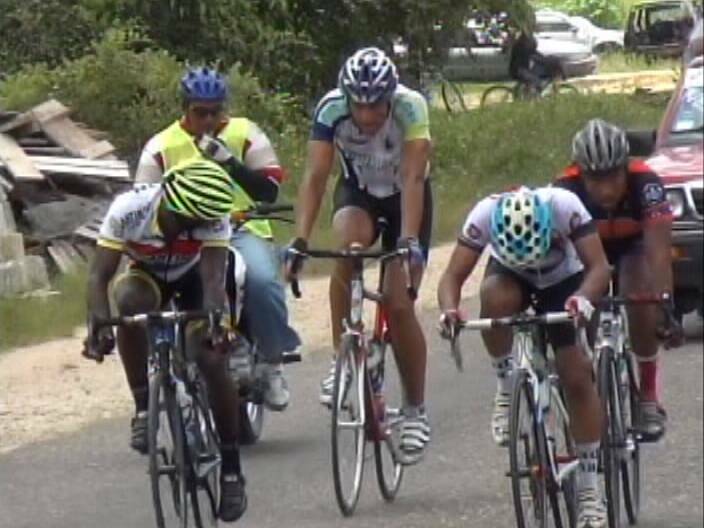 Meanwhile, when the lead duo rolls into San Ignacio over the famedHawkesworthBridge, it’s Giovanni Choto of Western Spirit in the lead role with Allen Castillo of Benny’s Megabytes still showing signs of struggle. As the race rolls into Ontario, the solitary figure of Young Choto commands the scene since Allen Castillo simply cannot hang on. A look at the back shows Hernan Ochaeta and Erwin Middleton try to pry on escape put of the pack but it would be short-lived. So the chase to catch Giovanni Choto begins in earnest and the man on the pace is the Mexican import and 2010 Cross Country Champion, Carlos Lopez. All the big boys unfortunately seem content to follow his wheel. All this while, Giovanni continues his miracle run and at St. Matthews Village, he’s beginning to believe he can get the job done on this solo flight nursing a four minute lead. 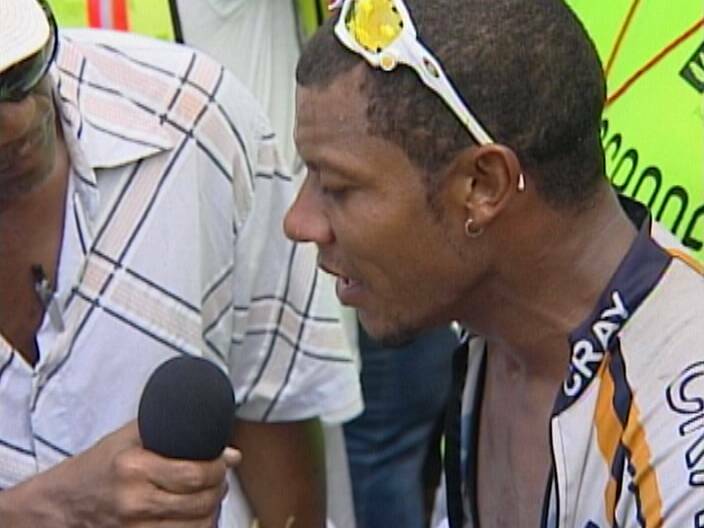 At Hattieville, Giovanni Choto is now only 1 minute 39 seconds ahead of a chase group of 4 but is buoyed by the fact that the Win is within striking distance. The chase 4 features Gregg lovell, Richard Troyer, Carlos Lopez and Donecetti Vasquez and they can see Choto’s number on his back. a couple seconds later, the other chase back with Darnell Barrow, Byron Pope and Brandon Cattouse shows up. 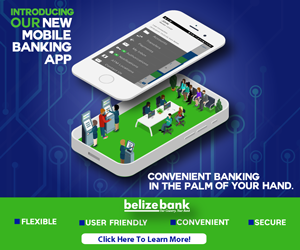 At mile 8, two important facts come into view—the Mexican, Carlos Lopez is no longer willing to carry the crowd across and the other Belizean hopefuls must now engineer their own run out Giovanni Choto. It’s a 9 man unit that features Byron Pope, Richard Troyer, Brandon Cattouse, Robert Stewart, Donizette Vasquez, Shane Vasquez and Gregg Lovell. 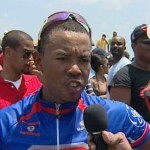 Around Leslie’s Imports, some 10 more riders have amalgamated with the chase bunch. 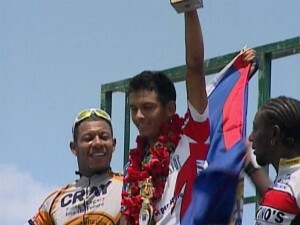 Nevertheless, the moment belongs to Giovanni Choto as he is uncontested at the roundabout into Central American Boulevard. At marine parade, Choto now knows he has the garland in the bag with no challenges in sight. 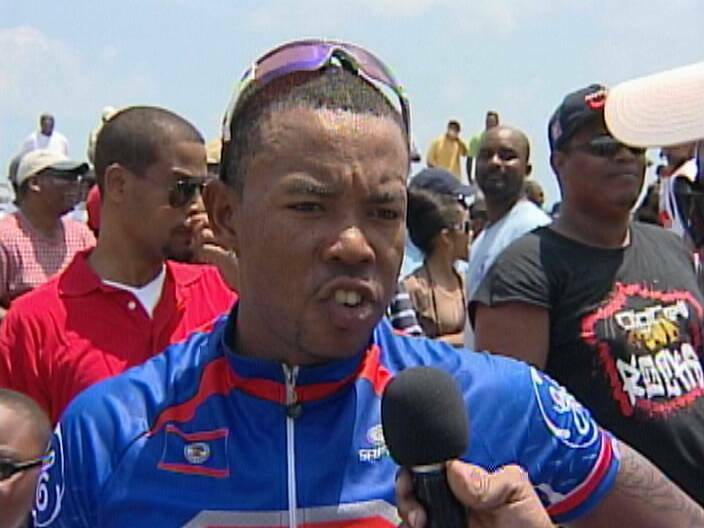 And we salute Giovanni Choto of Western Spirit as he wins his 1st Cross Country in 6 hours, 16 minutes 45 seconds and the 1st by a Belizean in 6 years. 2 minutes 12 seconds later, we have the battle for 2nd place and it’s Brandon Cattouse of C-Ray grabbing this position in impressive fashion, forcing Darnell Barrow of Santino’s into 3rd, Byron pope of Benny’s megabytes takes 4th and Gregory Lovell of Santino’s rounds out the top 5. 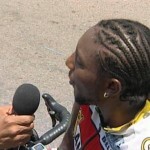 Jamaican American, Tony Taylor takes 6th, Donezetti Vasquez the Mexican 7th, Quinton Hamilton 8th, Peter Choto 9th and Jose Choto 10th. Next Year de guys wa d watch he, everybody mi thing he mi wa ge ketch but hey, he prove everybody wrong. Good job Jovanni, u d man. 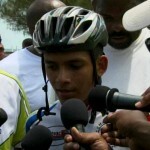 Could it be that Belizeans won because no powerhouse foreigners were brought in this year.